Mary Anna Evans and "Josie Belle" at The Poisoned Pen! As I headed over to The Poisoned Pen on Saturday afternoon to see "Josie Belle" (AKA Jenn McKinlay) and Mary Anna Evans, I fervently hoped that attendance would be much better than it had been on Thursday night when Denis and I had been there. I should not have worried. Jenn has such a devoted following that we all thought nothing of braving the I-10 sniper to see her and the equally talented Mary Anna Evans. As usual, I showed up early, reserved my seat, and bought my books. I sat reading in the back, stopping to chat whenever someone stopped by the table. When people started showing up for the event, I stopped reading. I've already mentioned Jenn's devoted following. Well, I've come to recognize several of her other fans, and we like to sit and chat before the event. "The Other Jenn" drives all the way from Tucson to see Ms. McKinlay, and she told me some really exciting news about being a Beta reader for another well-known author. This led Ms. McKinlay to mention emails telling her of every mistake readers have caught in her books. "I don't mind getting them, but not when the books are published and out on the shelves!" she laughed. She's got a point. Back on the farm, we call that closing the barn door after the horse has bolted. While we were happily nattering away, I happened to look over at the section of seating farthest from where the authors would be. Lo and behold, there was yet another author: Paige Shelton! Paige is the author of several wonderful cozy mystery series, and since she's moved down here to the Phoenix metropolitan area from Salt Lake City, we've been (very) slowly becoming acquainted through meetings at The Poisoned Pen and Facebook. Paige came over to join our group (that included "Josie Belle" herself), and before we knew it, it was time for the event to start. "...an author who brings her own food." Host and bookstore owner Barbara Peters was happy to see so many of us in the audience. She mentioned the delicious food that had been brought in by Mary Anna Evans' daughter, the owner of Rachel's Bake Shop in Queen Creek. 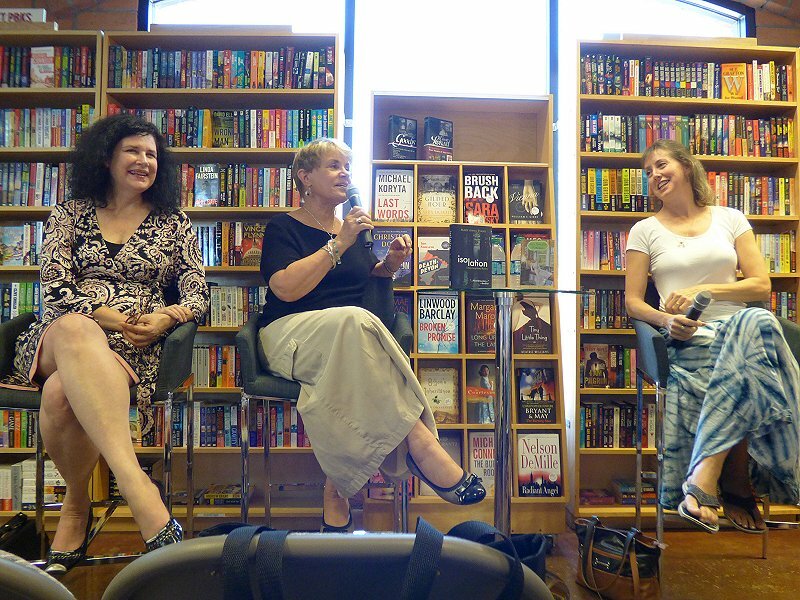 "It's so nice to have an author who brings her own food," Barbara quipped. Interrupting Jenn in her own (mid-) quip about being out of control around such mouthwatering goodies, Barbara looked at her with a twinkle in her eye and said, "I never have been able to control you! Why don't you tell us about All Sales Final?" "You make me sound like the bad seed!" Jenn pseudo-pouted. 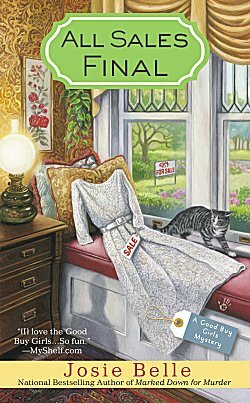 "It's been a lot of fun writing this series, but this is the fifth and final Good Buy Girls mystery," she said to many groans from the audience. "Maggie and Sam's wedding is fast approaching, and they've gone house hunting. They find their dream home in the historic district of St. Stanley, but strange things start happening in the house once they move in. People tell them the house is haunted, but Maggie and Sam don't want to believe it. Then Maggie finds a skeleton in the basement...."
Barbara had been reminded of a couple of things as Jenn talked about her latest book. "Did you know that it's very hard to sell a romance series unless it's complete?" she asked. 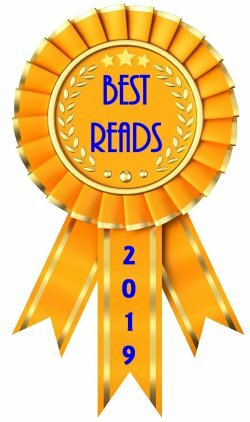 "Evidently romance readers don't want to invest time in a love story and run the risk of never finding out how it ends. I'm learning all sorts of interesting things from John Charles, who's in charge of our women's fiction section. "In fact, he is also a wonderful baker and has been bringing delicious things to share at some of our events. His pecan shortbread is to die for, and I've told him 'If ever you feel yourself on your way out, I want that recipe!'" "...so they can reserve their rooms early." 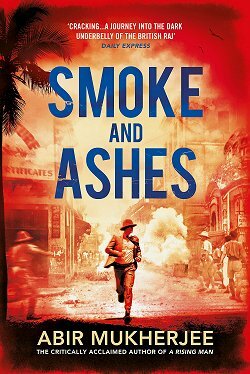 Friday, November 13-- Francine Mathews will be here to talk about her historical thriller Too Bad to Die. Rhys Bowen will also appear for her novella, Away in a Manger, a Molly Murphy Christmas story. Saturday, November 14-- Wow! 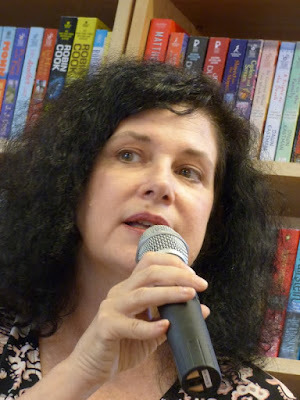 Betty Webb signs The Puffin of Death; Donis Casey signs All Men Fear Me; Jenn McKinlay signs A Likely Story; and Kate Carlisle signs Crowned and Mouldering. I repeat... Wow! Sunday, November 15-- Anne Perry signs Anne Perry's Merry Mysteries; and Charles Finch signs Home By Nightfall. Now you see why I want to camp out at The Poisoned Pen, don't you? There's an added, super-duper-special reason, too. 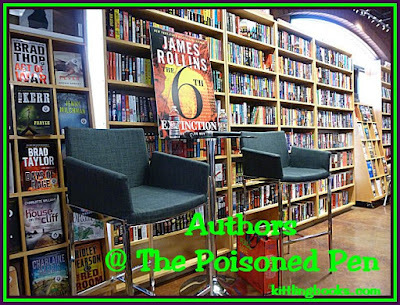 One of my blog readers will be in town visiting family and wants to go to The Poisoned Pen to see what I've been talking about (and to see some wonderful authors). I'm looking forward to meeting her! "Backstories are my little labors of love." "When the first book [Artifacts] came out, it was extremely difficult for my archaeologist friends to find a good word to say about it. They were absolutely horrified by the pothunting," Evans told us. "And in your books, there's always a past story, a past document," Peters said. "In Isolation, there's a Civil War backstory." "Yes, there is," Evans replied. "In the 1930s, the government sent people out to interview former slaves. In Isolation, there's a slave narrative written from the point of view of Faye's great-great-grandmother. 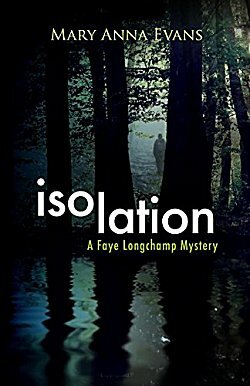 "Then someone comes along and accuses her great-great-grandmother of wrongdoing, and Faye wonders how in the world a person can defend someone who's already dead." Peters is a fan of Evans' backstories. Each one has been focused on a different historical document-- letters, diaries, oral history, etc.-- and I know from personal reading experience that they add so much to each book. "Backstories are my little labors of love," Evans said. "Where else can I get to be someone like a fifteenth-century priest?" Barbara and Mary Anna are looking for a story where Faye's husband Joe can be the lead character. In Isolation his father comes to visit. Joe's relationship with his father has been very difficult over the years, and the reunion is strained as well. "Joe was created not to be the love interest," Evans said. "He's almost the polar opposite of Faye. He's nine years younger, almost illiterate, he values emotions over logic... but he's also the best friend a woman could ever hope to have. He is the most rewarding character for me to write because he's so very different from me." "And Joe is a hunk," Barbara stated unequivocably. Yes, I can confirm that Joe is definitely a hunk, and in the next book, he'll be going to Oklahoma with a backstory involving the Trail of Tears. Barbara asked Jenn McKinlay about her problem characters. "I've had characters refuse to die," McKinlay said. "I'm a plotter [someone who plots out the action of a book before beginning to write]. I know Mary Anna is, too, although someone else I know is a pantser [someone who just starts writing without any sort of outline]...." She then looked at Paige Shelton and grinned. 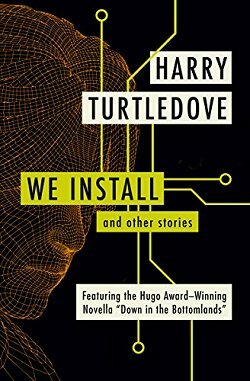 "I've had to completely rewrite entire sections of a book because one of the characters refused to go when I wanted them to." "Speaking of problems with books, I've just finished reading a manuscript from one of my authors," Peters said, "and it has three illogical plot points. I can't figure out how to make them work. It's the first time this author has done this. "And this woman here [pointing to Evans] created a character so evil, so crafty-- and she was going to get away with the crime. I told Mary Anna, 'Faye's going to have to man up and kill her!'" 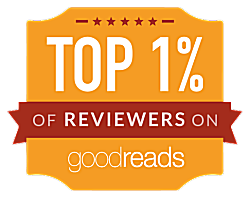 "In my defense," Mary Anna said, "I didn't think readers would accept Faye as a killer. Barbara is my moral compass, and when she says, 'Jail's too good for 'em,' I know she's right." "And I'll have you know that there's no way in the world that Darcy would have married Elizabeth!" Peters stated. "That family! Talk about the biggest piece of fiction! All Austen's other books work." There we all were-- most of us agreeing completely with Peters, yet still wanting to find a way to defend Austen. What a marvelous legacy-- writing a book that people are still passionate about two hundred years later! 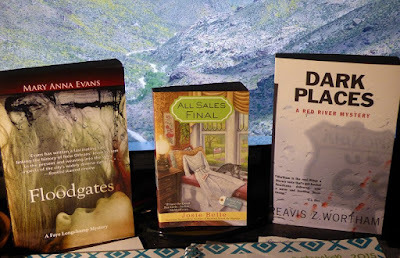 "Speaking of awards," Evans said, "I won a Florida Book Award for my book set in Mississippi. None of my books set in Florida have won it. Go figure!" 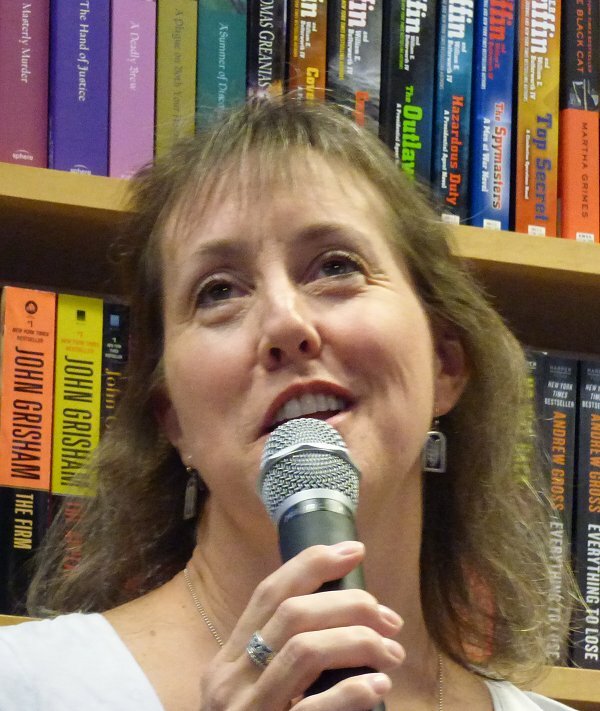 The next book to be published for Jenn McKinlay after A Likely Story is Copy Cap Murder (Hat Shop) in January followed by a Cupcake Bakery mystery, Vanilla Beaned, in April. "I've had so many good titles rejected," McKinlay told us. "There was my zombie walk mystery that I wanted to call The Baking Dead. They say things like 'It's not cupcakey enough.' I say, 'You do know someone dies...?'" One of the reasons the events at The Poisoned Pen are so great is Barbara Peters because she knows the publishing industry inside and out, and she shares some of her knowledge: "A lot of people don't know that the publisher holds the copyright on a book's packaging-- the cover, the typeface, the title-- while the author only holds the copyright on the words themselves." "I turned into a diva for my third cupcake book," Jenn said. "There was a kitten in the story, so when I first looked at the proposed cover I said, 'Why is there a monkey in a litter box?' It was the worst looking kitten I'd ever seen!" "Did you win?" asked a fan. "Oh, yes!" exclaimed McKinlay. "They changed the color of the cupcakes." "While we're on the subject of covers," Barbara said, "images are going away. They don't look as good online." As an example of the new style of cover, she mentioned Lee Child's newest Jack Reacher book, Make Me. She went on to say, "During the Depression, Penguin created mass market paperbacks. They knew people were looking for books that were cheap and portable. Now eBooks are replacing mass market paperbacks-- but they aren't replacing hardcovers or trade paperbacks." The conversation was changing direction from one comment and question to the next, and none of us minded a bit. As an editor, Barbara Peters had this to say about beginnings and ends: "If books fall apart, they tend to fall apart at the end. The beginnings are relatively easy to write. I have my authors send in the first one hundred pages of their books so I can make sure they're on track with their stories. Shortly thereafter, the event came to an end. Chairs were folded and placed against the wall. Signing lines formed. More goodies from Rachel's Bake Shop were consumed. I drove all the way home with a big smile on my face-- my usual reaction to an afternoon at The Poisoned Pen, especially if Jenn McKinlay is part of the group. Lovely! I love Jenn McKiinlay's cupcake series. Have not sampled her others up to now. And I've been wanting to start Mary Anna Evans' series for quite a while. The November time sounds like great fun! Thanks for the recap, Cathy! You are the best!